Do you have a passion for passion fruit? Then you might be interested to know that you can grow your very own even if you don’t live in USDA zones 9b-11, inside that is. The problem with growing them indoors is that passion fruit relies on bees to assist in their pollination. The solution is hand pollinating passion fruit flowers. How do I hand pollinate passion fruit, you ask? Read on to find out how to pollinate passion vine by hand. Passion fruit goes by several common names, including Purple Granadilla and Yellow Passion, but there’s nothing common about it. The fruit is borne off a vigorous 15- to 20-foot vine that bears unique blossoms. Each node on the new growth bears a single, aromatic flower quite unique in appearance. The blossom is enclosed by 3 large green bracts and consists of 5 greenish-white sepals, 5 white petals and fringed with a corona of purple rays with white tips. The fruit is round, dark red or yellow and around the size of a golf ball. Fruit is ready to eat when the skin wrinkles. The fruit is then sliced and the interior pulp eaten alone or as a condiment. The flavor has been described as somewhat like a guava to very strong orange juice; at any rate, it’s tangy. The fruit has a scent all its own and is reminiscent of fruit punch. 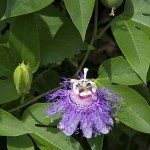 While purple passion is self-fruitful, pollination must occur under humid conditions. The yellow passion fruit is self-sterile. Carpenter bees are the most successful at pollinating passion fruit vines, more so than honeybees. The pollen is too heavy and sticky for successful wind pollination. So sometimes the vine needs some help. If you find you are lacking in pollinators or are growing the vine indoors, it’s time to take matters into your own hands, literally. The hand pollination of passion vines is an easy task that just requires some patience and a delicate touch. First, pick your pollinating utensil of choice. You can transfer pollen with cotton swabs, a small paintbrush, or even with nail clippers. Gather the pollen in the morning, within 4-6 hours of the flower opening. The blooms contain both male and female parts, yet are self-sterile, so the pollen is collected from one flower and then transferred to a flower on a different passion vine. Locate the stamen of the flower. This shouldn’t be difficult since the passion flower has 5 stamens topped by anthers that are fairly obvious in the center of the flower. 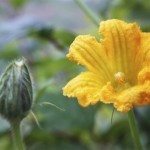 If you are using a cotton swab or paintbrush, just lightly dab the stamen. If using nail clippers, snip the stamen from inside the flower. Then just transfer the pollen to the female organ, the pistil, by gently rubbing the brush or swab against it. Passion flowers have three pistils. That’s all there is to hand pollination of passion vines. Keep in mind that yellow passion flowers won’t fruit unless the pollen they are exposed to comes from a different passion fruit vine.